After reading lawn people I really became aware of the huge amount of time we as Americans spend tending our lawns. Its the one thing that we have to maintain almost every week in the summer and many people take great pride in how their lawns look and appear to passer byes. I remember the first time i mowed the lawn how much fun I had and the more I did the more I would focus on getting those straight lines and trying to make things look good. The one thing I never did worry about though is what was in my lawn. At my house we just simply mow the grass to keep things looking orderly and to deter pests like insects and rodents. in the 21 years that we have had a lawn we have never sprayed chemicals on it or messed with the grasses in it. In fact there are several species of weeds in my lawn but from a distance you cant tell and I feel our lawn is healthier because of it. Today though lawns seem to be the exact opposite of what I just described, people put huge amounts of chemicals on their lawn and spend huge amounts to keep it just perfect. The fact that the grass for lawns is the largest agricultural crop in the US just goes to show this. The modern lawn is something of a monoculture which is not good, and the huge amounts of pesticides and herbicides that go into lawns is bad. Perhaps maybe there should be more done to step away from this type of lawn care. 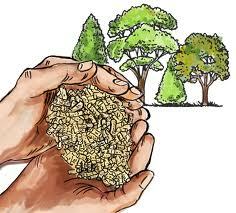 Interesting article on how wood is making a comeback thanks to pellet technology. The US and Europe relied on wood for heating only a century ago. These energy-dense pellets can be used to generate heat or electricity, or both at the same time. The pellets resemble dry dog kibble and are mostly made form mill residue like sawdust and wood shavings. The demand is especially strong in Europe, where high prices for heating oil and clean energy requirements have expanded interests in alternatives. However over the long term, interest in Asia and North America could grow rapidly as well. In relation the reading on Eating Animals I found an article condemning certain practices of slaughtering animals in Europe. There has been some uproar against the unacceptable rise in the number of farm animals slaughtered by having their throats cut while fully conscious. Currently this practice is allowed under UK and EU law to satisfy the dietary requirements of Jews and Muslims. However, there is substantial evidence that far more animals are being killed this way than necessary for religious reasons alone. Groups of activists are demanding that the animals be put under before they’re killed, and have proved tat throat-cutting resulted in very significant pain and distress. Just another reason not to eat animals. Week 7: 2/29 Threat to Life of Fishing? I decided to pick up a project idea to focus on stream and ecological restoration of the Delaware Run, specifically the area next to the football stadium and right behind the science center and the Aquatic Center. What is the Delaware Run you ask? Well, the Delaware Run is a collection of tributaries and makes up most of the Delaware County and it is in desperate need of stream restoration. This particular area of the Delaware Run, suffer from problems such as land sediment, surrounding habitat alterations, and water pollution including trash, toxic waste and more. Water pollution is one of the many environmental problems that exist in the present day and are the most troublesome to deal with. More than 70% of the Earth’s surface consists of water but only 2.5% of this is fresh water, which is the only water we can consume. Most of the water we are able to drink makes up the structure of glaciers and icebergs and can even be found in the clouds. The rest of the world’s water is made up of salt water which we cannot drink. Because of the small amount of water available for us, it is more serious that our drinking water is being polluted. 40% of America’s rivers and 46% of America’s lakes are so polluted that no one can participate in water activities including fishing or swimming. While this is a huge global issue for every single part of the world, there is hope for fixing this huge problem. The solution for this problem can begin by looking at the closest body of water and both preserving and cleaning it from the existing pollution. In this case, we should be able to start with the Delaware Run. The main goals of this project are to first brainstorm potential ideas on how to improve the state of that section of the Delaware Run. Once I find solutions on stream restoration, it is important to realistically evaluate and research these solutions carefully. I also want these solutions to be carried out if this project is not complete. The solutions I plan on coming up with are all simple and possible to put into action when talking with the right people. Most of the solutions to preserve the Delaware Run can all be found everywhere from researching from different sources to interviewing Delaware Residents for their opinions on what can be done for the Delaware Run. I also believe that one of the issues of the Delaware Run is the lack of knowledge the Delaware residents have on it. Lack of public knowledge tends to be the main issue for pollution of local waterways. There are so many solutions, some hard but some easy, that can easily be put into action and really make a dramatic difference in the state of the Delaware Run. I want this specific area of the Delaware Run to be restored because it is very close to our campus and I believe that by restoring it, our college campus can aim to be more sustainable. In order to carry out this project, the first step is to research solutions on how to restore the Delaware Run, especially the area right near our campus. Before I began my research, I decided to bring volunteers to the section I am focusing on and do a river clean-up so I can understand the state of that area. I took pictures of the area so I can become more familiar with its location and how close it is to our college campus. I plan on researching places two places that I interned for and looking up both problems and solutions for stream restoration. In addition to researching for online sources, I have collected information from three different people. I plan on including interview information from the Sustainability Coordinator, a city official and someone who has everyday encounters with the Delaware Run. I want my research to be diverse so I can discover different and unique solutions for stream restoration. While I am unable to complete this project by the end of the year, I want to come up with thorough solutions so the next person to pick up this project can put these solutions into actions and fully restore this section of the Delaware Run. Sean Kinghorn is the Sustainability Coordinator of Ohio Wesleyan University and is working on a few projects that will help improve OWU’s green status. I went to him for advice on what types of solutions I should be looking for to restore the Delaware Run. Brian McCombs works for Sustainable Delaware and is working on improving the Delaware Run through the government. I plan on talking with him more about what Sustainable Delaware is working on to find solutions. Gatz, John. Decline in the Index of Biotic Integrity of Delaware Run, Ohio, over 50 Years. Ohio State University. Web. 25 Apr. 2012. John Gatz is a professor at Ohio Wesleyan University who wrote a report on the biotic integrity of the Delaware Run. His report gave me insight on what types of aquatic species live in the waters of the Delaware Run. Dean, Cornelia. “Follow the Silt.” The New York Times. Web. 26 Apr. 2012. This article talks about a geology professor who examines the silty banks of the West Branch of Little Conestoga Creek and looks at reasons why the water flow is altering. Donna Thrush is the secretary for surgeons Dr. Fuller and Graffeo who I decided to interview for five minutes about her thoughts of the Delaware Run. I decided to interview at least one resident about the Delaware Run to gather an outside opinion on it. “Passaic River Coalition: NJ Environmental Organization.” Passaic River Coalition: NJ Environmental Organization, Homepage. Web. 25 Apr. 2012. <http://www.passaicriver.org/whoweare_aboutcoalition.html&gt;. The Passaic River Coalition is a place I interned where I worked on river restoration. They have several solutions for how to preserve the Passaic River which can potentially be applied for the Delaware Run. Brian has tons of data on the Delaware Run and the Olentangy River which consist of useful land data, a list of problems and more. “Our Services.” Hui Ku Maoli Ola. Web. 25 Apr. 2012. <http://www.hawaiiannativeplants.com/about-us/our-services.html&gt;. The Hui Ku Maoli Ola is another place that I interned at that has also done stream restoration on the Waimanalo Stream which can all be applied to the Delaware Run. These solutions involve both informing Hawaiian residents about it and moving debris and trash with hands. “CartoonStock – Cartoon Pictures, Political Cartoons, Animations.” CartoonStock. Web. 25 Apr. 2012. <http://www.cartoonstock.com/&gt;. The cartoons from this website all advertise environmental cartoons to raise awareness in a satirical way. Hairston, James E. “Water Quality Information System – Environmental Restoration.” 302 Found. Web. 25 Apr. 2012. <http://www.aces.edu/waterquality/nemo/alex.htm&gt;. On this website, there is information on rain gardens and how they reduce the runoff and decrease erosion which serves as another potential solution for the Delaware Run. You are currently browsing the Environmental Geography blog archives for May, 2012.